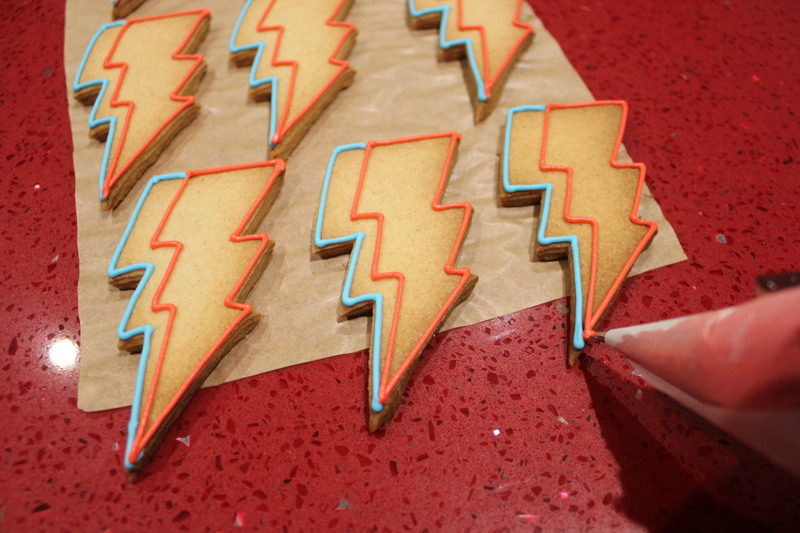 Simple vanilla cookies, given the Aladdin Sane lightning flash treatment. 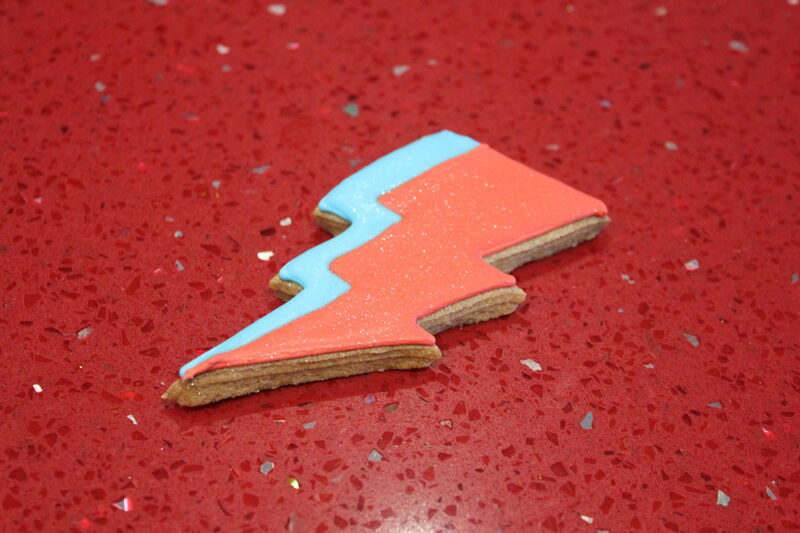 As a fan of all things Bowie, to have this opportunity to honour him in cookie form is a constant joy. They are something of a labour of love as the icing takes a little time and patience to perfect, but these treats are well worth it. Beat the butter and sugar until pale. I prefer to use golden caster sugar for the caramelly flavour that it gives, but you can use regular caster sugar if you like. Beat in the egg until combined. Spoon in a generous teaspoon of vanilla bean paste into the wet mixture. Beat in the flour, all at once, pulsing at first to avoid a huge mixer cloud! As soon as the mixture forms a lump, you are done. Remove the dough from the mixer bowl, press into one large flattened round, wrap in clingfilm and refrigerate for 30 minutes. Roll out your chilled dough on a clean worksurface, lightly dusted with cornflour or icing sugar to prevent it sticking. A non-stick rolling pin will save your sanity and marzipan spacers (click here to buy) will ensure an even thickness for every cookie. 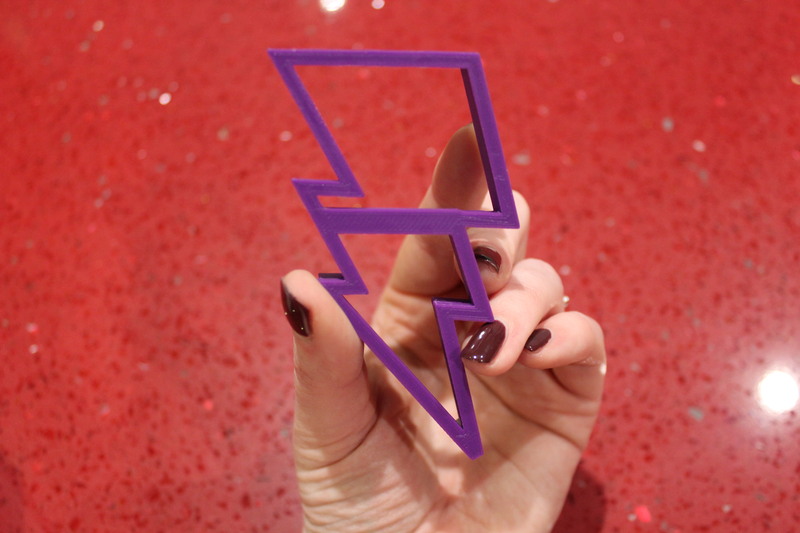 Cut out your cookies with a lightning flash cookie cutter (mine was from Etsy) or use a sharp knife to cut around a cardboard template, it’s easy enough to make your own. Lay your cookies on a baking sheet, lined with baking parchment, and refrigerate again for 15 minutes. Preheat your oven now! Bake your cookies for 10-13 minutes, until they are golden and dry to the touch on top. Allow to cool completely on their baking sheets. Prepare your royal icing to the instructions on the packet and beat to soft peak stage. Divide the icing between two bowls, colouring 1/3 of the icing light blue in one bowl and 2/3 of the icing red in the other. Spoon 2-3 dessertspoonfuls of each icing into a disposable piping bag fitted with a small round piping nozzle. Add water to the remaining icing until it becomes a runny ‘7 second icing’. Remove your spoon from the icing, count to 7, and there should be a completely flat surface in the bowl. 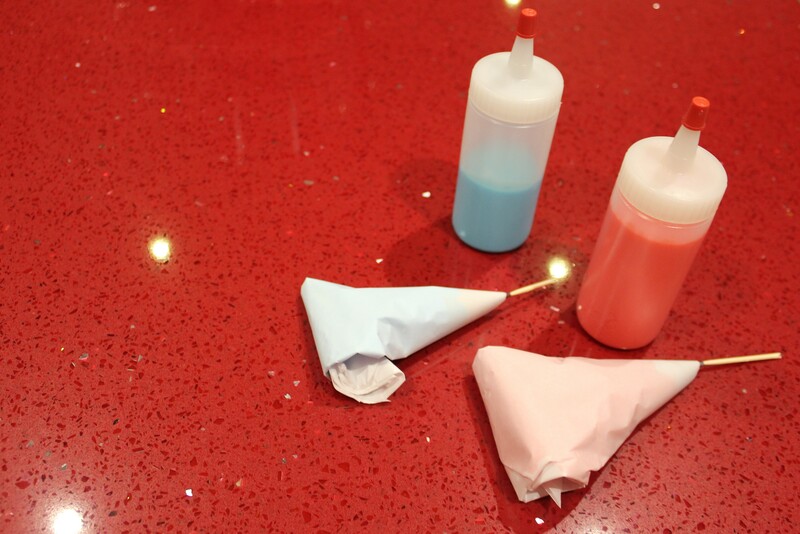 Pour this icing into squeezy bottles. Pipe a line of pale blue icing along the left hand side of your cookies. 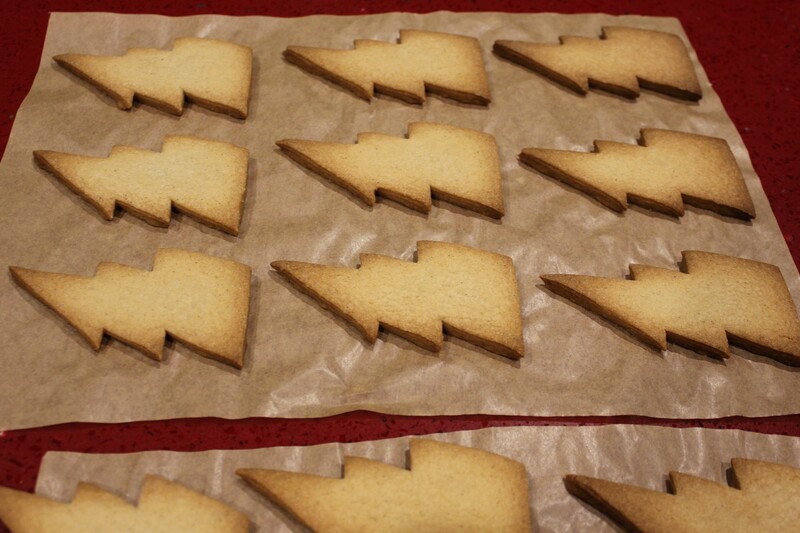 Continue the line approximately 1/4 in along the top edge of the cookies. 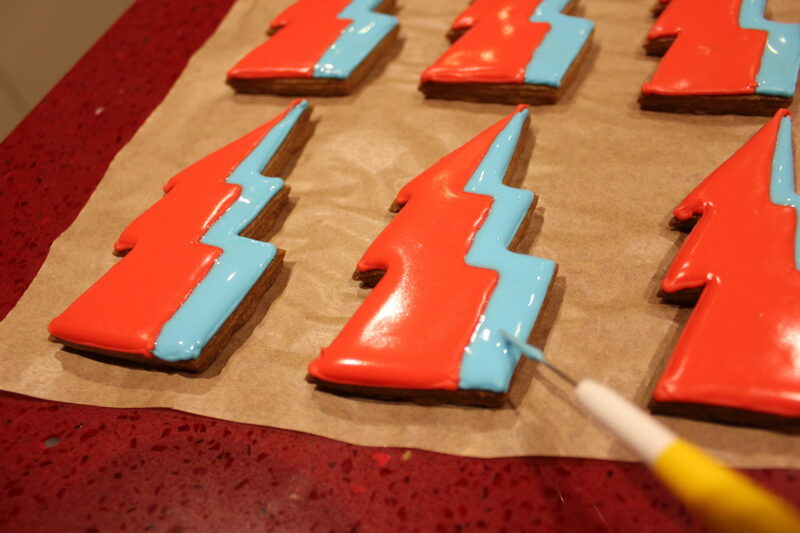 Pipe a line of red icing along the right hand side of your cookies and along the top edge to meet the pale blue line. Pipe another line through the middle of the cookie, creating a larger red area than blue, ensuring that the lines meet at the bottom. Give the icing 10 minutes or so to dry. Squeeze red icing into the right hand section of the cookie, staying well inside the edges. 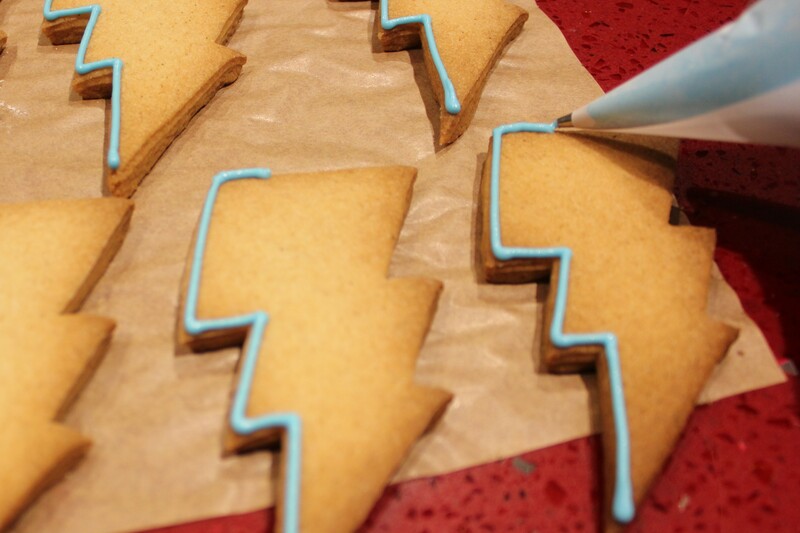 Use a cocktail stick or a scribe tool to tease the icing out towards the edges of the cookie. 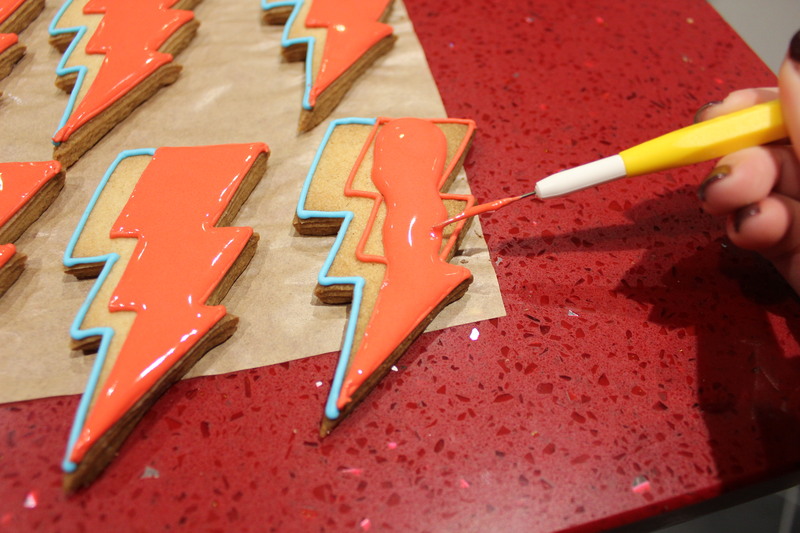 If you squeeze too much icing in, you run the risk of it overflowing the barriers that you have piped so be sparing. Repeat the same process with the runny blue icing in the left hand section of the cookie. Be very sparing as this is a small area to fill. Allow your cookies to dry completely for around 8 hours before boxing, bagging up, or generally showing them off! I can make this for you!